Home > Meet the Doctors > Aimee Paul, M.D. Though originally from Colorado, Dr. Paul calls Kentucky home. She attended Transylvania University completing a Bachelors Degree in Chemistry in 1996 and went on to graduate from the University of Louisville School of Medicine in 2000. She then traveled further south to complete her residency in Obstetrics and Gynecology at Wake Forest University in 2004. 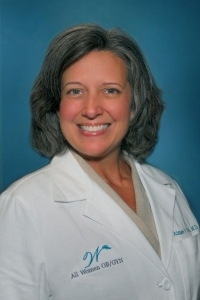 Dr. Paul has been in private practice as a partner with All Women OB/GYN, PSC since her return to Louisville in 2004. She is a member of the Kentucky Medical Association, the Greater Louisville Medical Society and the Louisville Obstetrics and Gynecology Society. She is a Fellow with the American College of Obstetricians and Gynecologists and is Board Certified by the American Board of Obstetrics and Gynecology. Dr. Paul is married and has three children. She enjoys being active in her surrounding community of the Highlands and traveling and spending time with her family. She can also be found frequenting Actors Theater of Louisville, UofL sporting events, many of the wonderful restaurants in Louisville and live music events. She recently took up knitting and likes to read real books as opposed to digital ones.